2015 marks the 175th anniversary of Cunard Line's first transatlantic crossing. This event is worth remembering because Cunard was the first line to offer regularly scheduled steam-powered crossings. In so doing, Cunard not only shortened the time to travel between Europe and North America from 30 days to 11 days but also brought a degree of certainty to transatlantic travel. Furthermore, in the 175 years since that voyage, Cunard has posted a host of remarkable achievements, both in peace and war, as well as fielded a string of iconic ships including Mauretania, Lusitania, Queen Mary, Queen Elizabeth, Caronia and Queen Elizabeth 2 (QE2). Cunard has been celebrating its 175th anniversary throughout 2015. At the end of their world voyages, Queen Mary 2, Queen Victoria, and Queen Elizabeth met briefly in Southampton. (See photo feature). This was followed a few weeks later by a meeting in Liverpool in which the three ships “danced” in the River Mersey in front of more than a million people. On a more somber note, Queen Victoria was in Cobh, Ireland for the 100th anniversary of the sinking of the Lusitania, which occurred just off the Irish coast in World War I. On 4 July 2015, Queen Mary 2 was back in Liverpool to commence a transatlantic crossing sailing from the same port and 175 years to the day that Cunard's first ship, Britannia, began her first crossing. Like Britannia, Queen Mary 2 would call in Halifax, Nova Scotia and Boston, Massachusetts. Unlike Britannia, she would continue on and conclude her voyage in New York - - New York being the western terminus of Cunard's transatlantic crossings for most of the company's existence. Along the way, there were numerous celebratory events. Flyovers and fireworks in Liverpool. In Halifax, home of the line's founder Sir Samuel Cunard, a new public space was dedicated to Sir Samuel and a new exhibit on Cunard was opened at the Maritime Museum of the Atlantic. QM2's Captain Keven Oprey threw out the first pitch at a Red Sox game in Boston. He also rang the bell signaling the close of trading at the New York Stock Exchange. In New York, the day began with a flotilla of historic ships escorting Queen Mary 2 into the harbor. It ended with a spectacular light show centered upon Queen Mary 2 as she passed the Statue of Liberty on her way out to sea. 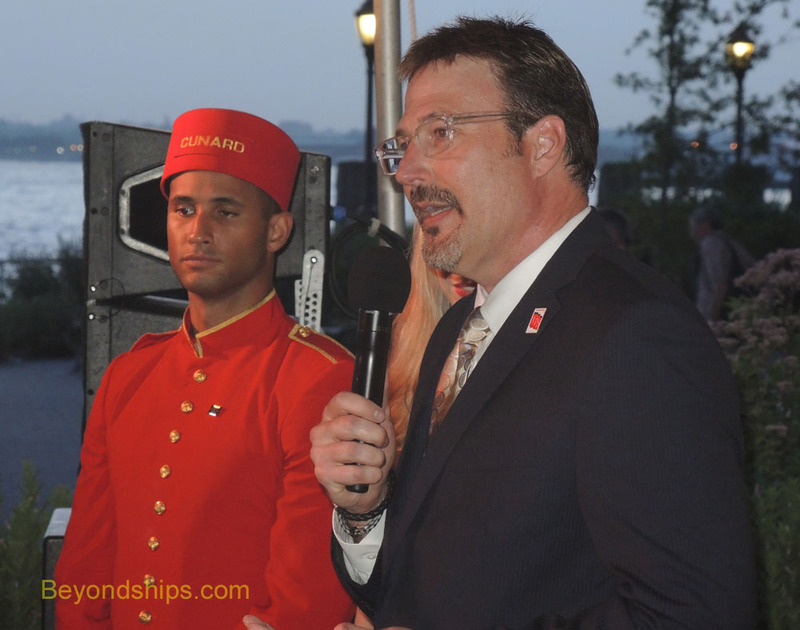 At an event before the light show, Cunard was looking forward as well as celebrating its past. While several reliable sources denied that there are any plans to build a new ship for Cunard, there are definite plans to make a significant investment in the line's flagship Queen Mary 2. 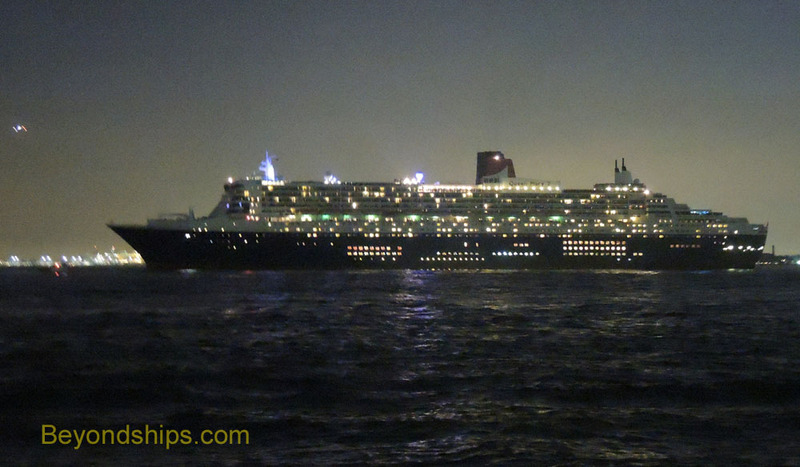 “Queen Mary 2 is an icon in the world of luxury ocean travel; certainly, the only true ocean liner that is in service today," commented Richard Meadows, President, Cunard North America. "After we have celebrated this historic crossing, re-creating what the Britannia did 175 years ago, it is only fitting that we talk about the next chapter of the QM2."